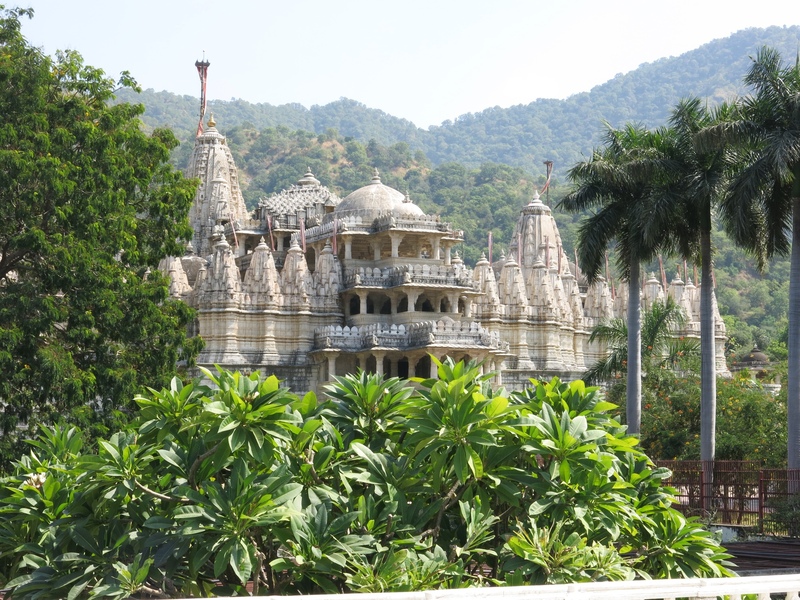 We arrived in Jodphur yesterday afternoon after a long drive from Udaiphur ( with a stopover for a quick look-see at a famous marble Jain Temple in Ranakpur…. Memsahib had a priest say a prayer for her there…. which she had to pay for….but I declined the offer…. ‘Bloody Athiest’ I thought I heard him mutter in Hindi. In India, traffic, (like Indian society) is structured on a strict caste system. The following take precedence and the rules must be adderhed to at all times. In descending order, give way to cows, elephants, camels, buffalo, pigs, goats, dogs, heavy trucks, buses, official cars, pedal rickshaws, private cars, motorcycles, scooters, auto-rickshaws, hand-carts and finally, the lowest on the pecking order, pedestrians. Our driver, Dev is a very good, safe driver, and so far I haven’t had cause to fault him. Other vehicles though seem to adhere to the maxim that ‘to slow is to falter, to brake is to fail, to stop is defeat’ This is surely taught in the driving schools here ( If they have them!) As I mentioned in a previous post, you absolutely cannot drive here unless you use your ‘horn’ at least every 2 minutes ( in the countryside on a clear road) or every 20 seconds in the city. Another rule seems to be that any manouvre you make , the use of horn, evasive action, change of lane, left turn, right turn etc, shall be left until the last possible moment……and under no circumstance use your indicators…..that’s strictly for the weak minded…..other drivers will have read your thoughts by the process of osmosis….. somehow, it all seems to work though. Even safe old Dev will take a short cut up a one way street…in the wrong direction…. a couple of toots on the horn and away you go. 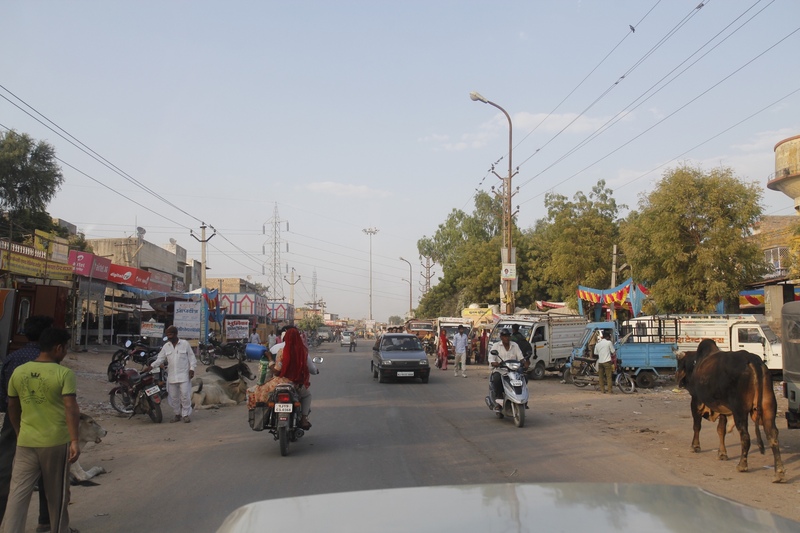 Yesterday, on the dual-carriageway highway, the rest stop we were preparing to stop for a cup of Masala Chai at was on the other side of the highway, about 300 metres ahead of a turning point. 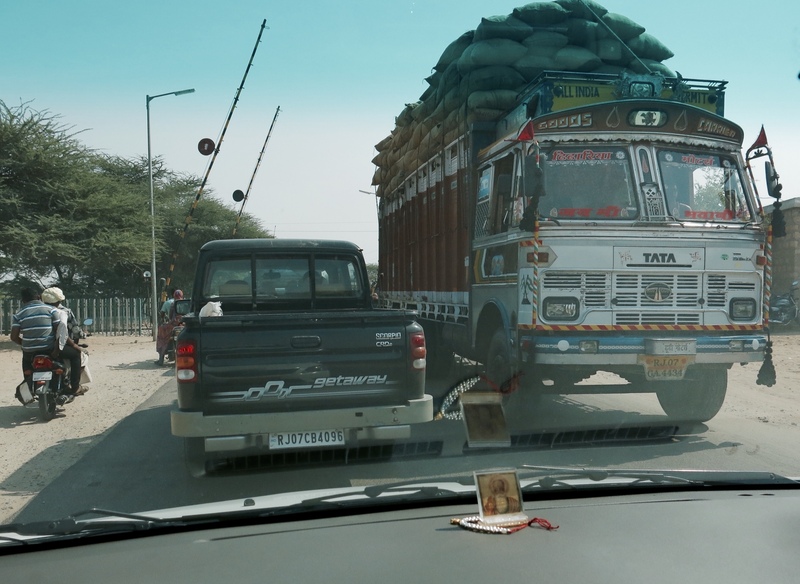 We were travelling west, but Dev simply crossed over into the East bound lanes and proceeded up a two lane highway for the 300 metres, against the flow of traffic. ( Phew)…… of course, with a photo of the Indian equivalent of Saint Christopher on the dashhboard, these manouvers are entirely safe!!!!! Saint Christopher or Krishna on the dash...whatever, he has so far kept us safe! Today is Deepvali ( or Deewaali if you cant be bothered prouncing the ‘P’) , the main Hindu festival ( it’s the festival of light) which means lots of noise from all the ‘bangers’ ,firecrackers and fireworks which the locals spend hundreds of dollars on ) Our hotel here, The Raas, is a bit different from others we have stayed in, in that it’s a really stylish, very hip, very sleek ‘boho chic’ place, which blends old with brand new, and has spectacular Jodhpur Fort views from our two story ‘suite’ as a bonus. Our guide here is a lovely personable guy, name of Pummi…. ( prounounced like somone from Birmingham would say ‘brummie’). 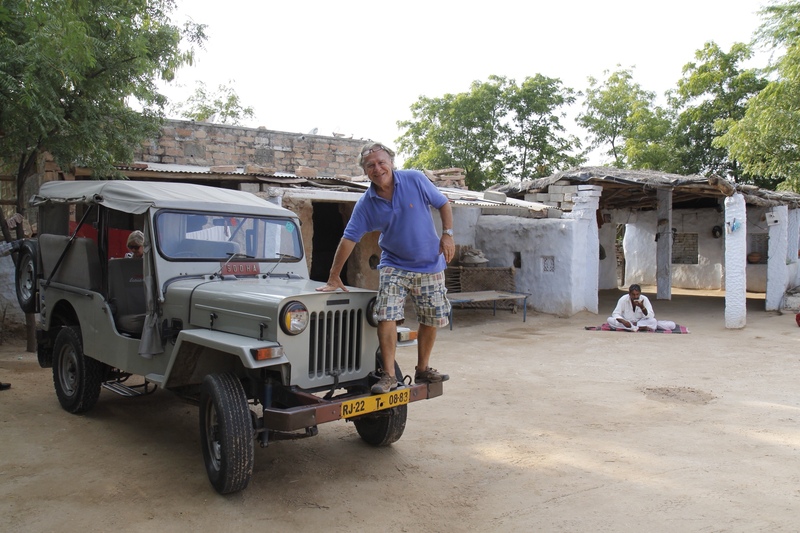 He escorts us around the usual tourist traps sites here in Jodphur in the morning, then after lunch at a restaurant called ‘On the Rocks’ ( we had a decent ‘Thali’ there), we exchanged our ubiquitous Toyota Innova for a military style ‘jeep’ and a new driver. Accompanied by Pummi, we headed off out of town, and into the bush. 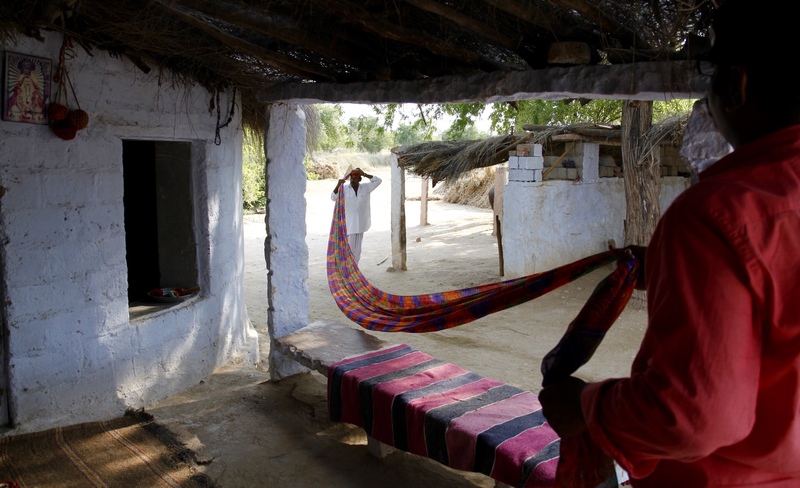 We were going to be visiting some desert villages inhabited by the ‘Bishnoi’s’, a tribe of indigenous Rajasthani’s. Our next stop is really facinating….. we drive through the countryside for another 20 minutes, down some very narrow roads tracks…. we are going to visit a Mr Brijal, who owns a small farm. The reason for our visit though is not to see his cows and goats, it’s because Brijal-ji is also an Opium Addict…. and he has ‘invited’ us to an Opium Ceremony. 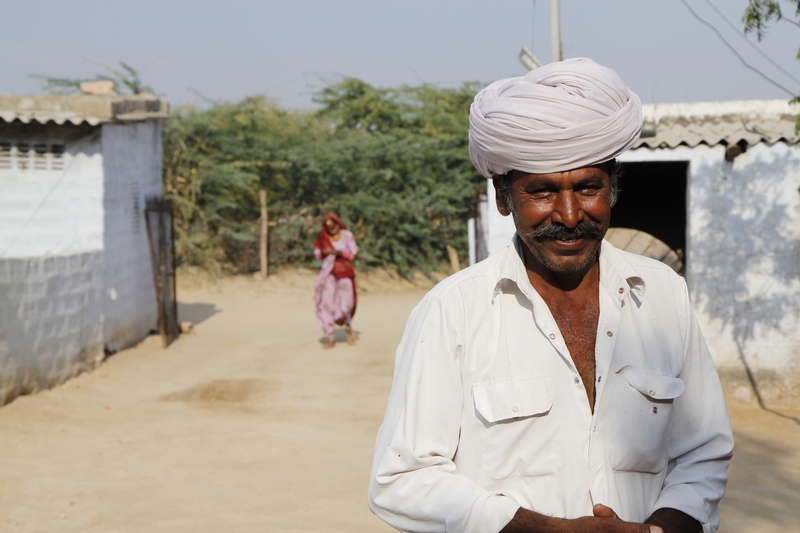 We are met at the gate of his property, a small cluster of ‘cow-dung’ thatched huts by a fine tall distinguished looking character, dressed in traditional style and with a white turban on his head. He sports a large white moustache also, and an even larger smile on his face, and I notice that his eyes are also smiling….and twinkling. After some introductions by Pummie, Brijal-ji offers us some ‘Chai’….tea. It’s what everyone here drinks, called Massalla Chai, it’s made similar to ordinary tea with milk ( but lots of milk) with the addition of ginger, nutmeg and cardamon…. or various other combinations….. It’s very refreshing too, but needs to be drunk very hot or the milk in it tend to ‘scum-up’. While I accept his gracious offer, ( Memsahib declines but I don’t want to offend his feelings ) I’m thinking to myself about the quality and cleanliness of the water used to make it. I can see the well he uses to draw water, but obviously he must have boiled the water first….so what could possibly go wrong! 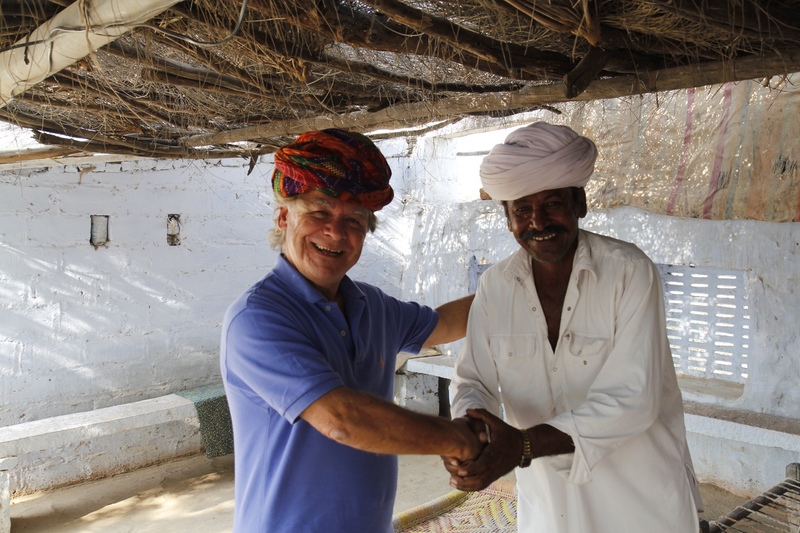 After spending some time showing me how to tie a turban…. which he then places on my head, we all sit down to start the ‘ceremony’…. no, not the tea ceremony but the Opium one. He brings out a ‘poppy head’ to show us, and our guide Pummie interprets the way that the Opium is extracted. Normally, the opium is mixed with water and offered to tourist guests in a small cup, but Brijal-ji has a surprise for me. 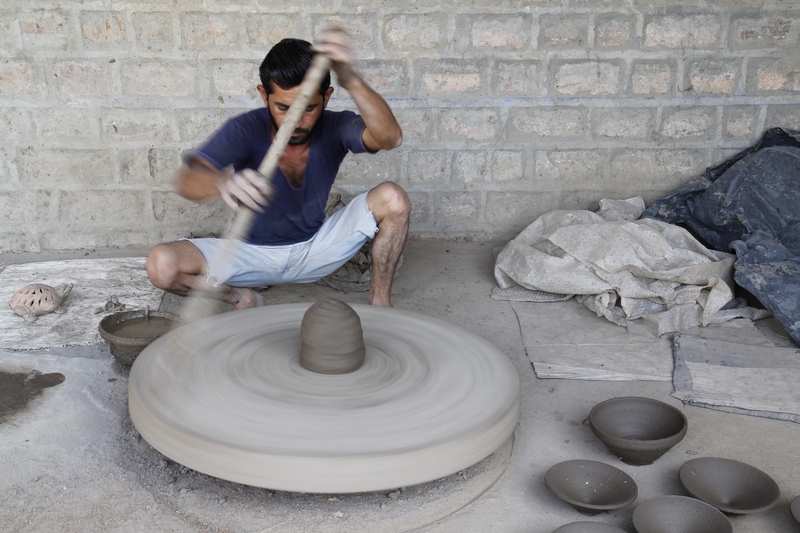 Is Opium legal in India then?…. the answer is yes and no ( the answer you would expect in India). 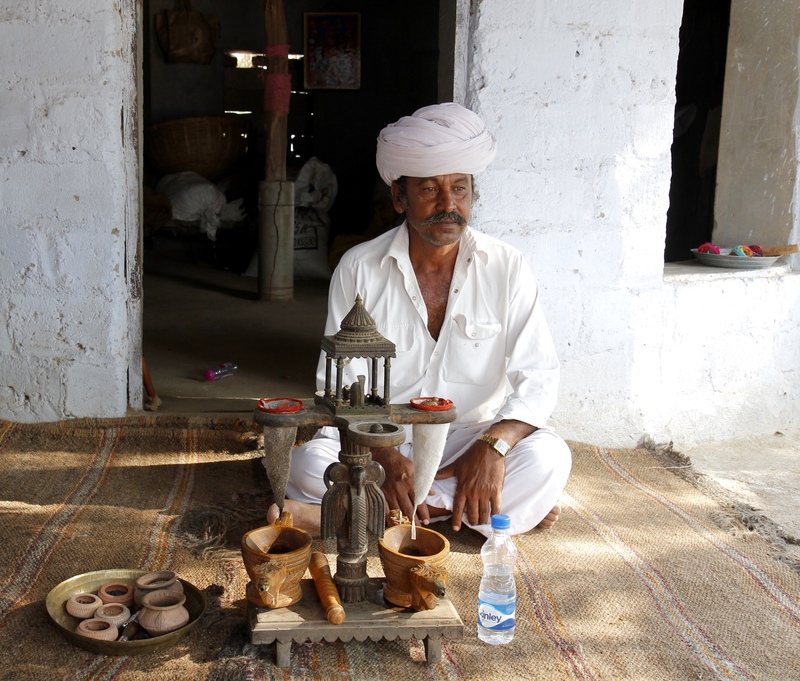 For tribes like the Bishnoi, they have been using this stuff for centuries…..they don’t partake of alcohol or tobacco…. the work is hard, life is tough, and so need occasionaly to let their hair down ( or take off their turban). It seems that as long as they dont posses more than 2 grams of the drug, then the authorities wont bother them……I ask where he gets his supply from ( dont get any ideas, I’m only curious) but am met with a shrug of the shoulders, and that funny little sideways head shake that can mean anything…… It’s complicated, but like much in India, it seems to work. I’m also told that Opium causes constipation, which in India is a welcome side affect. 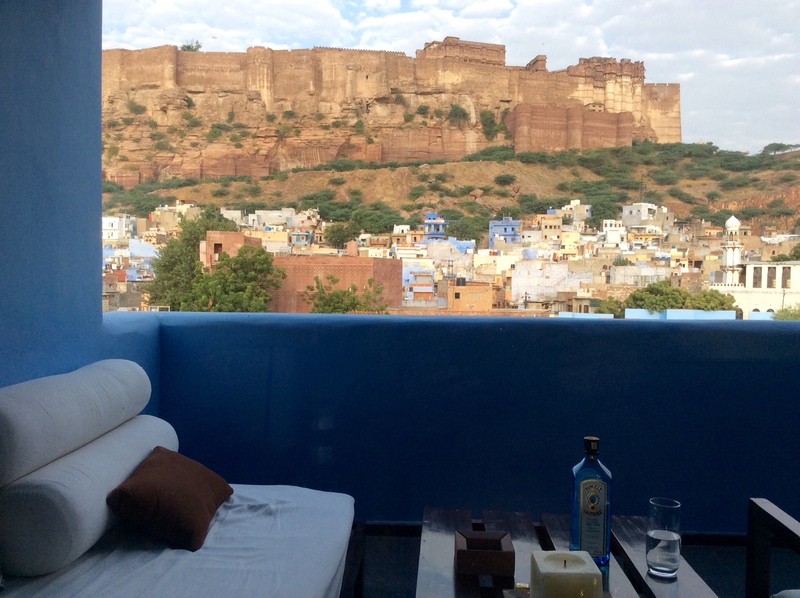 The Journey back into Jodphur City flys by….. I wonder why? Where's the door to the jeep? 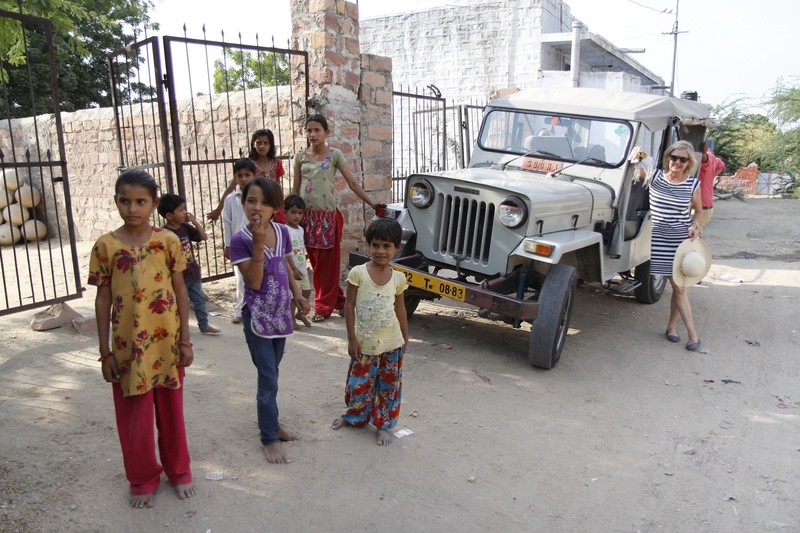 PS: The photo below was taken in a small remote village in the backwaters of Rajasthan, where we had stopped to buy some water…. bottled water. This young girl who followed us around the village, was so pretty and delightful and natural I just had to take this photo of her…. 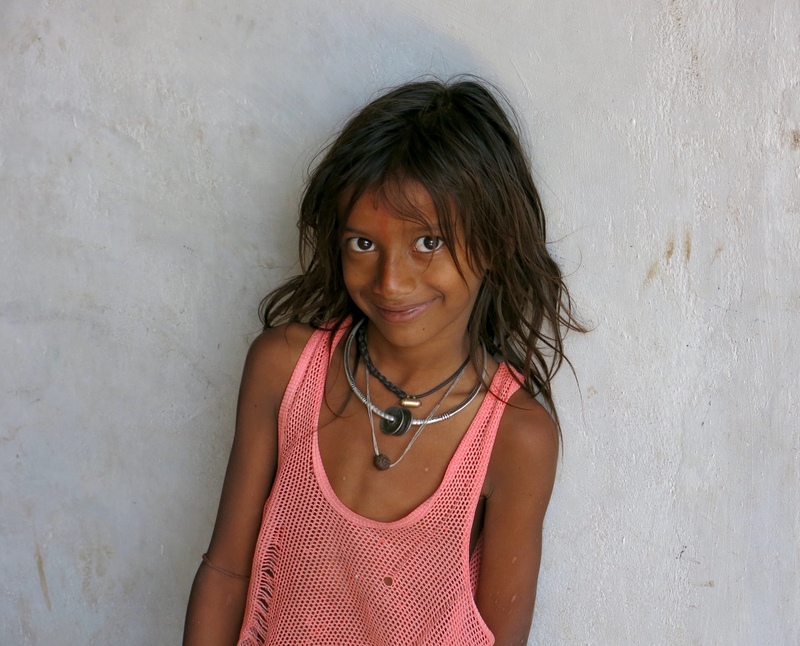 look at her smiling eyes…..I wonder what will be her future? the future miss world perhaps? You write so well Tom,fascinating stuff! Thanks for sharing your travels with us as we are having a good laugh reading your blog and reminiscing sharing good times together. Notice a bottle of Bombay kerosene on a table in one of your hotel rooms. Guess that you feel obliged to support the Indian economy.